At Kingsley Books, we like to think of the space we have created as a place where thoughts and ideas can go to be shared. Ben Franklin, arguably one of the most creative thinkers of his time, shared his own thoughts and ideas, accumulated over eight decades, by a variety of means, including his famous almanacks. With a nod toward Franklin, Kingsley Books intends to publish a literary almanack every year dedicated to the dissemination and consideration of diverse thoughts and ideas, toward fostering a deeper understanding of the world we, of necessity, must all share. If you would like to be considered for publication in a KB almanack, please click GET PUBLISHED below. 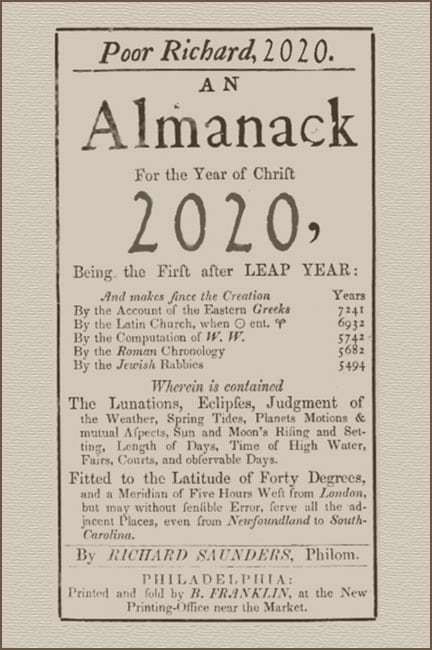 KB’s almanacks will be published in the style of Poor Richard’s almanacks, beginning in 2019 (for the year 2020). 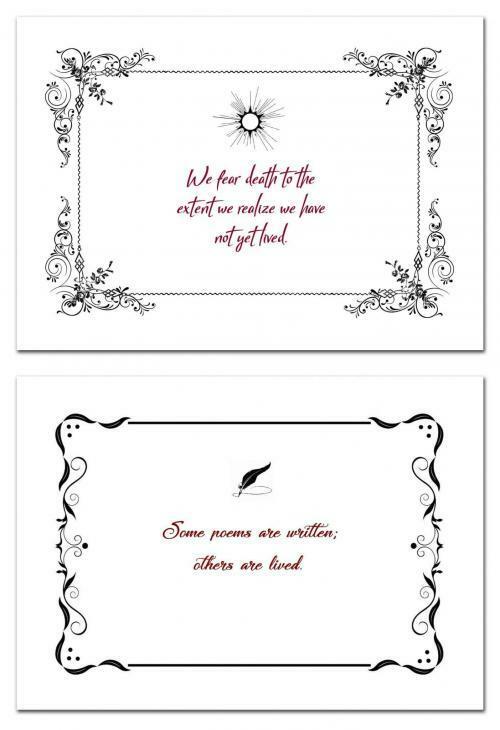 Each almanack will be offered for sale on the KB website, on a limited edition basis. Gabriel, a pre-adolescent gray squirrel, is being tormented at school by the socially dominant letes, led by Chopper and Bammer, who are always finding new ways to humiliate Gabriel in front of their peers. Gabriel is estranged from a biological father who has lost all contact with his only son; alienated from a stepfather who seems to resent Gabriel’s very presence; and barely tolerated by a popular older sister, Cherice, who beats Gabriel time and again at video games. 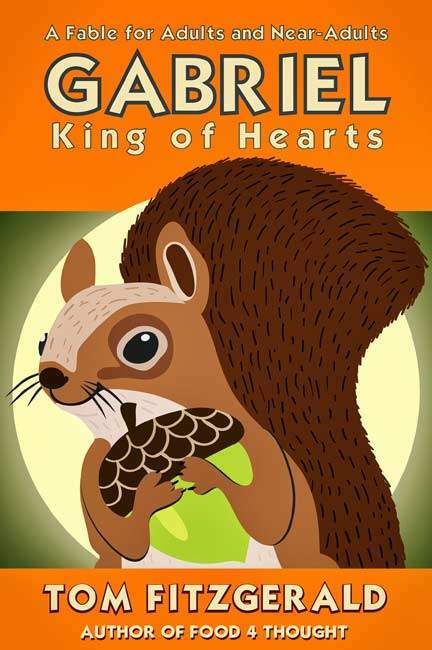 To the chagrin of his mother and stepfather, Gabriel is no longer welcome at the Church of the Sacred Elm, where Gabriel recently asked the Reverend Willow, in front of the entire congregation, if the Great Rodent could create an acorn so big he couldn’t eat it all. Curious and reflective by nature, Gabriel had meant no harm; he had simply been unable to resist the demands of an insatiable curiosity. Increasingly despondent and desperate, Gabriel sends a letter to Scurry McMurray, a celebrity pawnut player, requesting Scurry’s autograph. Gabriel hopes that possessing even a tiny piece of a celebrity pawnut player’s greatness will elevate his own stature in the eyes of his tormenters. When Gabriel does not receive a reply, he sets out, woefully unprepared, on a quest to get the great Scurry McMurray’s autograph in person. Venturing deeper into the forest than he had ever been before, Gabriel becomes hopelessly lost. What now? Adults and teens who have been bullied or marginalized in their lives, or who have contemplated taking desperate measures to end their pain, will find deep comfort in this poignant tale. 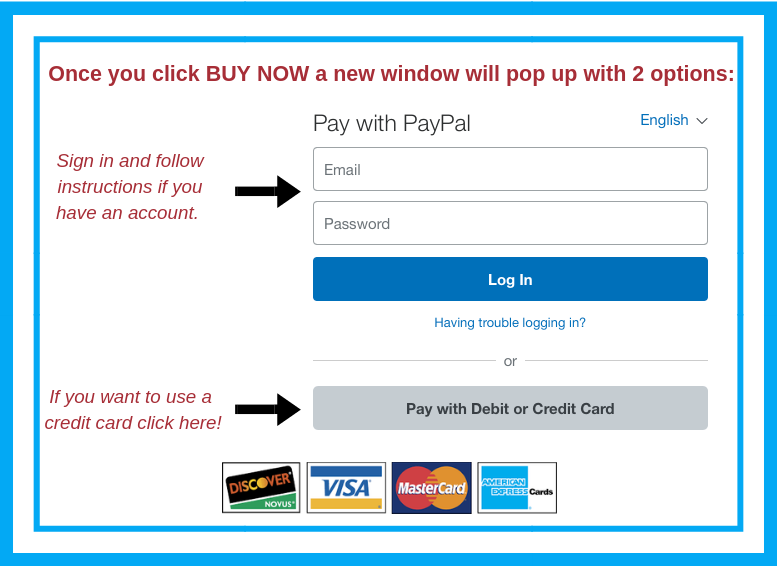 Before you make a purchase, note that you can add this item to your cart (the blue "ADD TO CART" button below), which enables you to add more products, or you can click the yellow "PayPal Buy Now" button if you're ready to buy this item now. Either way, you have a choice to pay with PayPal, but if you don't have a PayPal account, no problem, you can always pay with your credit card. 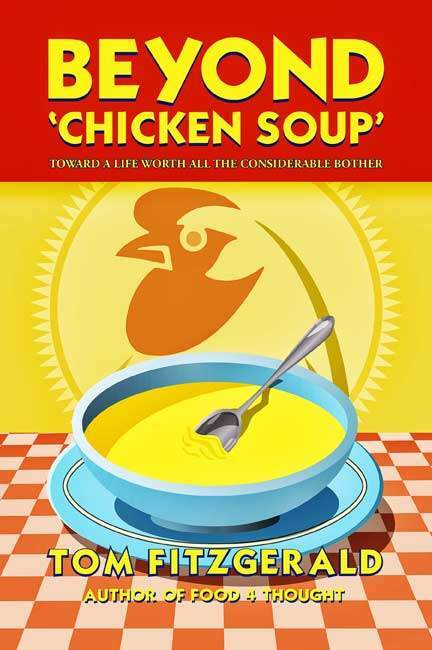 As its title suggests, Fitzgerald’s well-designed follow-up to his Beyond Chicken Soup (2019) takes its initial cues from Poor Richard’s Almanack, collecting the author’s wisdom and gentle humor on a wide variety of topics, ranging from ethics and morality to God to loneliness to sports. The author shifts easily from a tone of jocularity to one of serious concentration and back… The tone adopted throughout is that of inviting conversation; readers seeking practical reminders of everyday wisdom will doubtless respond. A friendly, all-purpose compendium of thought-provoking intellectual odds and ends. The wisdom in this unique offering will help guide and nourish you. Bread fills the belly; wisdom fills the mind; together they feed the soul. Tom Fitzgerald's Richard the Poorer’s Food 4 Thought is soul food like no other. I love this book! “Richard the Poorer’s Food 4 Thought is a smorgasbord of thoughts and ideas carefully crafted to stimulate cogitation on all manner of topics and issues. For those cogitators who prefer snacky or hors-d’oeurvey kinds of fare in this regard, Food 4 Thought offers 880 bite-sized morsels in the form of what Ben Franklin referred to as ‘moral sentences, prudent maxims, and wise sayings.’ These tidy tidbits fall into 57 categories ranging from Anger to Men & Women to Hope & Happiness to Work & Career. “For those cogitators who prefer a little heftier fare, Food 4 Thought offers 69 mini-essays on a wide range of topics, from courtship to the state of manhood in America to the real cause behind the obesity pandemic. These ‘Buns & Biscuits,’ as they are herein referred, are a page or less in length and are meant to be partaken of one or two at a time. For those cogitators who prefer something heftier still, Food 4 Thought offers several hardy entrées. 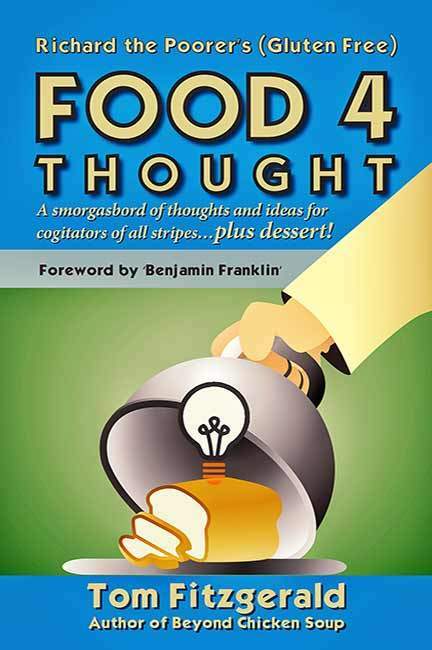 Rounding out Food 4 Thought’s salivating fare are several exotic confectionaries. A must-have volume for the loo! How did Tom Fitzgerald get inside my head and know exactly what I needed to be told? A thoughtful and thought-provoking book. "Many of us who grew up in the Boomer Era were afflicted with a sort of chronic angst. Something not quite identifiable was ever not quite right. In an earnest effort to rid ourselves of our dis-ease, we tried all manner of remedies. We took the Road Less Traveled; we nurtured our Inner Child; we cared for our Soul; we ran with the Wolves; we illumed ourselves in Celestine light; we had conversations with God; we got tight with our Guardian Angel; we cavorted with the Goddess; we embraced the latest Diet; we pursued our Soulmate; we drummed in the Woods; we went on Vision Quests; we slurped Chicken Soup – by the bucketful; we squatted with the Buddha; we sat in Sweat Lodges; we recovered our Cheese; we rebalanced our Chi; we chanted in Sacred Chambers; we followed our Bliss; even paid the toll for the car behind us. “Despite all these efforts, however, a sense of angst, both in ourselves and in the nation at large, would seem only to having gotten worse, as evidenced by a steady rise in such health-of-the-nation indicators as alcohol abuse, domestic violence, single motherhood,, absentee fatherhood, school shootings, road rage, teen suicide, personal debt, obesity, binge buying, clinical depression, device addiction, distracted driving, divorce, and opioid poisoning. “Why? How could such a wealth of remedies on the one hand lead to such dismal results on the other? One possible explanation – and the premise of this yet-one-more-book-on-the-subject – is that, instead of our having been encouraged by the self-help and mental-health communities to aim the arrow of our concern a bit more toward other people, we have been encouraged to keep the arrow of our concern disproportionately aimed toward ourselves. Seekers after the kind of life that will matter even when one is gone might want to keep one copy of this unique offering at their workplace, a second on their nightstand. A grand and gorgeous book! I devoured it! The pleasures of prose, passion, and intelligence pervade these pages... Fitzgerald is that rarest of birds: a great writer and a great soul. – Michael Zuckerman, PhD, Professor of History, University of Pennsylvania. 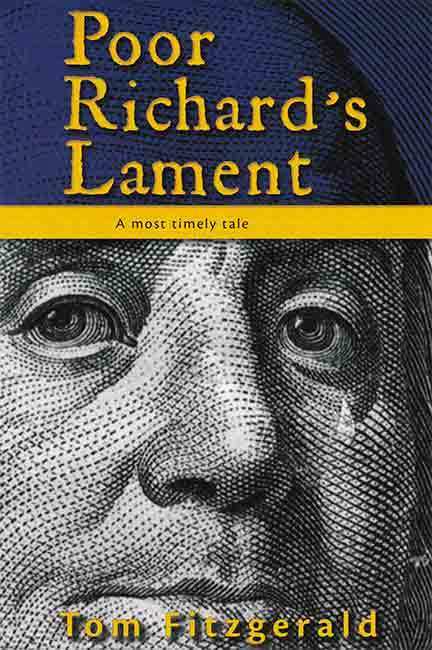 Please note: Poor Richard's Lament is available at Hobblebush Books. Click the blue "BUY BOOK" button which will re-direct you to the Hobblebush Books shopping cart page.